"Very early in the morning we saw land to the right at a mile distance, going southeast. We sounded and had 40 fathoms, with southwind along the coast of this mountainous land covered with snow. After noon, we saw land to the east which was a mountainous and broken land.These lands would be far about 8 miles one from the other. Around noon the currents were large. We were in 54 degrees, 46 minutes. After noon, we found northwind that carried us to the strait. 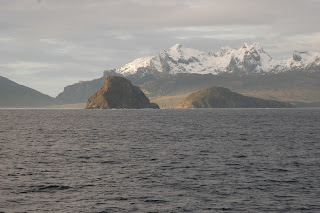 The wind dropped in the afternoon and this evening we were taken by the current and saw many penguins and whales.We were now close to the land recently discovered on the East. High and broken, apparently running southeastwards. We gave it the name "Statelant", in our language "Land of the States..."
With this vision of a rugged land elongated dutch sailors became the first men to discover the location of the island. Its initial name was due to the mistaken belief that it was a peninsula of Terra Australis. The Staten word referred to the 7 provinces of the Netherlands, which at that time were fighting for their independence. Years later, in 1643, Hendrick Brouwer circumnavigated Statenlant, noting that it was in fact an island and not a part of the continent. Thus, The Staten Island, a small bastion of rock of 65 miles long and a max. width of 16 kms., battered by waves and Antartic winds appeared in the future maritime cartography, separated from the island of Tierra del Fuego by the Strait of Le Maire. George anson, a British commander, wrote in 1790: "It`s a horror territory, with peaks of prodigious height and terrifying precipices, it is difficult to imagine anything more savage and gloomy." The dramatic description of Anson is due in large part to the rugged geography of the island. Its 530 square miles(including isla Año Nuevo(New Year Island) and Dampier and Menzies Islands, are comprised of twp mountain ranges that cross the island from end to end, with deep valleys, bogs, lakes, fjords, bays and cliffs that fall to the sea. Walking on the island is difficult.Everything around seems to be made of solid rock and the wild vegetation and the tall silhouettes of the mountains seem to close on the observer as walls. 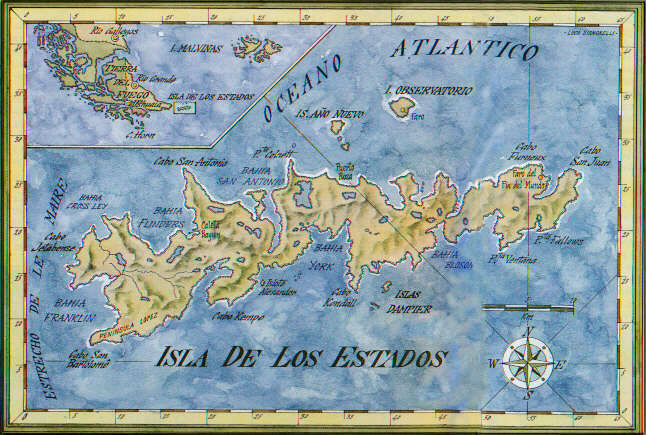 Isla de los Estados is part of the province of Tierra del Fuego, Antarctica and South Atlantic Islands. 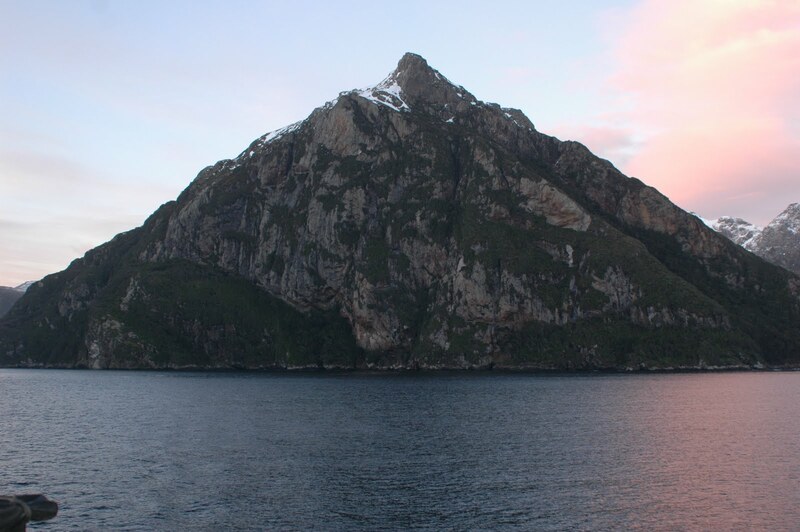 Only 38kms separate the island from the Eastern tip of the Big Island of Tierra del Fuego. These are the few miles that make up the dreaded Strait of Le Maire which apparently has its origin in the same glacial age as the Strait of Magellan. Its waters with giant swirls of 20 or 30 m in diameter and waves that give the impression of a sea boiling with water fountains that rise vertically to collapse suddenly. Showers with poor visibility, in a extremely cold region, for those few miles can become the worst nightmare for every sailor, regardless of their craft. It is located between parallels 54° 34´- 55° 10´ S and the meridian 63° 40´- 65° 03´W approx. Its length is of approx. 63 kms. in a WSW-ENE direction. Its width is variable, with a minimum of approx. 500 mts. in the isthmus between Port Cook and Vancouver Port. Its mountainous terrain is the eastern end of the fueguian mountain range and presents sharp and craggy peaks reaching 823mts. high in the Bove mountains and maintain their summits covered with snow most of the year. 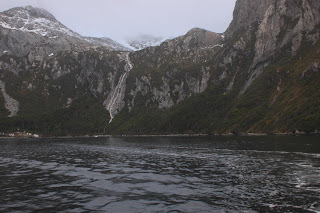 It also presents a very irregular and rugged coastline deeply cut by numerous bays which have a glacial origin and are home to numerous fjords( the only place in Argentina where they were found).The long and narrow valleys have greater development on the north side of the island. The northern coasts have long stretches of cliffs of 20 to 50 m. high. The coasts of south flank are high and jagged cliffs, the sea is deep in the vicinity of the coast. There are only sandy beaches in some entries in the minors of Brent Bay. The climate is oceanic, extremely humid, with rainfall close to 2000mm. per year. The predominant winds are from NW and SW with an average of 16.5 knots, but changing from calm to gusts exceeding 40 knots can be sudden. The average intensity can be defined as “strong”, being this the only place in Argentina with that average. Thus the thermal sensation varies between “moderate cold” and “intense cold”. The winds are a major factor shaping the landscape and conditioning human activities. The predominant vegetation is the evergreen forest, consisting of a combination of “guindos” (notofagus betuloides) and “canelos” ( drymis winterii), accompanied by a dense undergrowth of ferns, lichens and mosses that give a lush appearance. 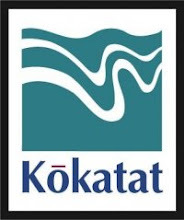 Its coastline is known for dense marine forests of brown algae. Other important plant communities are peat bogs and coastal grassland of “tussok” (Poa flabellata) which occupied considerable extensions in the reserve. These plant communities are absent in the Argentine continental territory and are rare in the extreme south-east of the island of Tierra del Fuego. Articulo 2°.- To determine “ Area of Natural Monument or Sanctuary” to those exclusively reserved to access scientific and under strict control, as a Scientific Detachment Base. Articulo 3°.- To declare “Area of Natural Reserve” with limited human access to those with use for the scientific and tourism on the island. ( Spheniscus magellanicus). Among the birds forming colonies are the southern giant petrel (Macronectes giganteus) is also included as vulnerable by IUCN, and black-necked cormoran (Phalacrocórax magellanicus). Among other species of limited distribution in the extreme south of the country and habitat limited to the coasts are the southern carancho (Phalcoboenus australis),the antartic remolinera (Cinclodes antarcticus) and the coastal cauquen (Chloephaga hybrida). The two hairs sea lion communities (Arctocephalus australis) in the Isla de los Estados are, except those of Malvinas Islands, the most important in Argentina. There is also the one hair sea lion (Otaria flavescens), a species that suffered a significant quarrying in the past. The southern elephant seal (Mirounga leonina) has been registered on Goffre island- New Year Islands- but it is still not known if breeding in the area. The reserve has special value for the conservation of two endangered species of otters, the huillin (Luta cause) and chungungo (Lutra felina) currently being the only place in Argentina where both live. As for terrestrial fauna the mouse of guindales (Abrothrix xanthorhinus llanoi), is the only native terrestrial mammal registered described as exclusive of Isla de los Estados. Among the exotic species is the domestic goat (Capra hircus), the red deer (Cervus elaphus), the black rat (Rattus rattus), brown rat (Rattus norvegicus) and the european rabbit (Oryctolagus cuniculus). Isla de los Estados presents a variety of historical sites associated with human settlements between the nineteenth and twentieth centuries in various sectors of its coastline, which joins a large number of shipwrecks whose stories dates back to the sailor pioneers of these seas. The names list of those who sailed their coasts and suffered is extensive and many are remembered in the naming of fjords, bays, creeks, and other geographical features of the reserve. In 1884 was established in port San Juan de Salvamento the Sub. Prefectura (Coastal Guard) and the military penal colony and also the lighthouse was installed, which was later moved to Observatorio Island to collaborate with the international Antartic expeditions. The only human settlement is a detachment of the Argentine Navy in Port Parry. In addition to these activities of the Navy, scientific research and development of authorized visits under a project for the restricted, regulated and controlled use of the island for tourism are the only activities permitted in the Reserve. MARINE LUIS PIEDRABUENA AND " THE LUISITO"